As a start of the new year I decided to participate in The 30 Days Music Challenge, starting today. This means at least one post per day until the end of the month! My first thought was that the challenge shouldn’t be too difficult for me, but already spotted a couple of days which will get me in trouble… Well, let’s see what happens! Day 30 – Choose an album, any album! It’s your last day! Congratulations if you got this far! The Album Cover is from Wikipedia. Type O Negative has been one of my favourite bands through the years, for almost 15 years. There’s been times when I’ve forgotten the band for awhile, but eventually returned to this album, and the songs work every time! 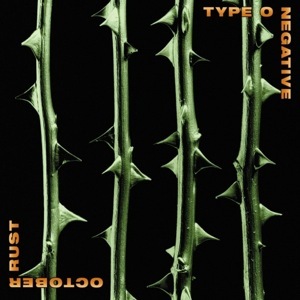 October Rust is Type O Negative’s fourth studio album and was released already in 1996! The songs like Wolf Moon, Be My Druidess and Love You to Death are my favourites. And of course the big hit, My Girlfriend’s Girlfriend. Also, I was lucky to witness Type O’s live show in Tuska Open Air festival in Helsinki in 2003. It was really a tough decision to pick just one favourite album. I like music in broad scale and different kind of genres. Sometimes my favourite depends on my mood, the day, what I’m doing at that moment etc. In addition to the TON album, I have to mention my all time favourite Moonspell album called Darkness and Hope, Motley Crüe – Saints of Los Angeles and Edguy – Hellfire Club. And tomorrow my opinion can already be changed!